Pulsating dental water jets or oral irrigators have been used for dental healthcare for over 50 years. The pulsating stream of water and special tips provide a treatment for braces, sensitive teeth, plaque and gingivitis. One manufacturer offers countertop water flossers with 3, 6, or 10 pressure settings ranging from 10–90 or 10-100 PSI and cordless water flossers with 2 or 3 pressure settings from 45–75 PSI. The pressure range and adjustability vary depending on the type of water flosser. With the lowest (1) setting of 10 PSI and the highest (10) setting of 100 PSI, the ten adjustments steps on one model provide approximately 10 psi increments between steps. The user does not have to relate to the actual pressure but just know that if they have sensitive teeth they want to start with the #1 step (10 psi). Experienced users often use the higher-pressure settings. 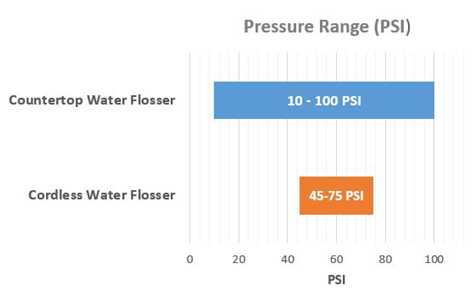 Since the pressure settings are all relative, a pressure sensor is not required in the flosser. However, as in any product that involves pressure, the design pressures need to be verified by laboratory testing to establish the typical and maximum pressure settings and verified in manufacturing for consistent quality using highly accurate pressure sensors.